To show or not to show, that is the question. What the heck are you talking about, you may say. Well, we are talking about your socks of course! The trend these days is to show some skin, some ankle skin to be exact. We know that this is fine in milder climates, but some of you live in areas that are just plain frigid. So we think you can show some cool socks too. Here are some examples of how we would wear our shoes from the shop with or “without” hosiery. First up the ever popular ankle boot. Everybody has a pair, right? We would wear these P. Monjo boots with no-show-socks if we were wearing a midi length dress or skirt. With a pair of jeans, we would flash these fancy crane crews. 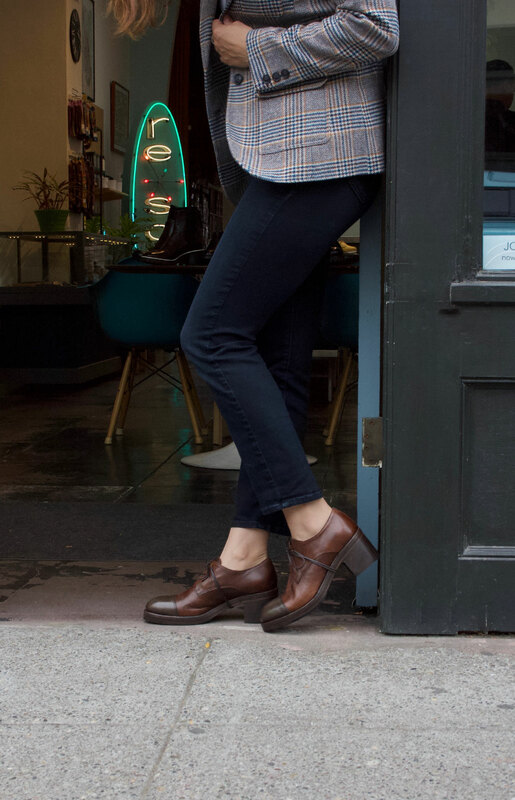 We love a good oxford around here! We think it’s perfectly acceptable to pretend we are wearing no socks as well as to show off some really cute designed ones too. Tall boots. Totally okay to not show your socks obviously, but we also think it’s super cute when they peek out the cuff too. These are just a few samples of what we have at re-souL. To see more of our shoe and sock collections, visit us in Ballard or shop on-line at resoul.com. Hello! We are starting to finally feel like Fall in the Pacific Northwest. How is your Fall shoe wardrobe looking? Time for an update? Let us show you some new arrivals as of late. Click on pictures below to see more information and details about our new arrivals at re-souL. For the latest up-to-date news, follow us on Instagram @shopresouL. To see more visit us here at the shop on Ballard Ave., or visit us at resoul.com. Fiorentini + Baker is a brand that was established in 2001. It’s creator and designer Deborah Baker moved to Bologna, Italy to set up a studio to design a collection of shoes that would be understated and have a low key attitude. Eighteen years later the F+B brand is still going strong due to their timeless classics and attention to quality. The constructions are hardy and substantial. Tuscan leather uppers and Goodyear welt soles make the styles last and last, season after season, and year after year. Not being a slave to the current fashion trends, the philosophy is simple – create styles that can be worn everyday, put-away and forgotten about, only to be rediscovered and worn again. re-souL has been carrying the collection for 15 years, and we personally wear them ourselves. We can attest to the longevity of wear and the comfort that makes these shoes so very special. To see the current collection, click here for women and here for men.